Buying and selling need great attention in terms of both the buyer and the seller. It looks simple but indirectly it is a perplex process especially when it comes to purchasing of big assets like land, property and, business. When it comes to the seller, their duty is difficult but it is a one-time job. Once they are done with developing the setup, they just sell and order the stock. Even during buying of daily households, the customer needs to buy with much care. The product should not be defective; the product should not be expired. The appliances should be checked before final payment etc. While purchasing big assets like land or business the first and foremost requirement is to check the legality of such things. It is an obligation on the buyer. The second thing to be focused is proper market research and knowledge. The buyer should be aware of the respective rates and policies regarding the type of purchase he is having. The letter followed is a letter of intent to purchase. It can be used for purchasing any asset like land, business or property. 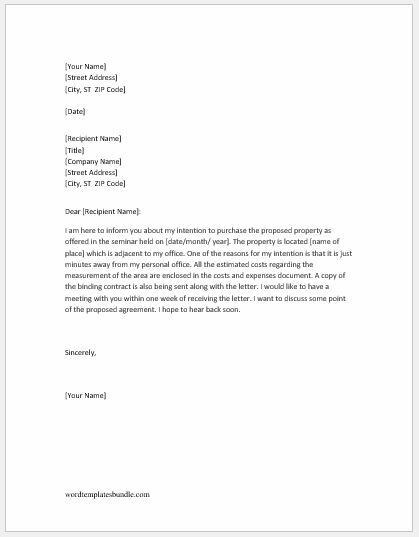 The letter of intent is an important part of purchasing assets. Authentic information is required in such letters. Signatures and complete addresses are also important. I am here to inform you about my intention to purchase the proposed property as offered in the seminar held on [date/month/ year]. The property is located [name of place] which is adjacent to my office. One of the reasons for my intention is that it is just minutes away from my personal office. All the estimated costs regarding the measurement of the area are enclosed in the costs and expenses document. A copy of the binding contract is also being sent along with the letter. I would like to have a meeting with you within one week of receiving the letter. I want to discuss some point of the proposed agreement. I hope to hear back soon. 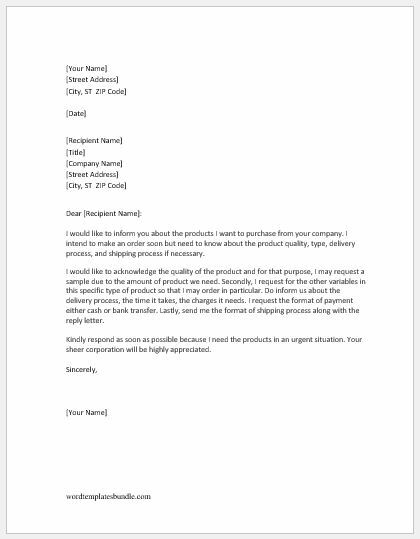 I would like to inform you about the products I want to purchase from your company. I intend to make an order soon but need to know about the product quality, type, delivery process, and shipping process if necessary. I would like to acknowledge the quality of the product and for that purpose, I may request a sample due to the amount of product we need. Secondly, I request for the other variables in this specific type of product so that I may order in particular. Do inform us about the delivery process, the time it takes, the charges it needs. I request the format of payment either cash or bank transfer. Lastly, send me the format of shipping process along with the reply letter. Kindly respond as soon as possible because I need the products in an urgent situation. Your sheer corporation will be highly appreciated.